Offering you a complete choice of products which include belt conveyor, portable belt conveyor, overhead belt conveyor and assembly line belt conveyor. Belt Conveyor for the handling of bulk materials and packaged bags in a straight line or through changes in elevation or direction. It gives ease in transporting light weight to bulky material like food products, cement, lime powder, iron ore, fertilizer bags, boxes, clay, lignite, bagasse & Stones etc in different frame designs (Stringer, Gantry, Gallery Type) as per specific requirement. Slide bed assembly for light loads and roller-bed assembly for medium to heavy duty application are suggested. For assemblies and sub assemblies of electronics & automotive products etc. We provide conveyors with built in operational tables on either side of the conveyor and with lighting fixtures. Flat-belt, as well as trough-belt portable loaders, are also available. 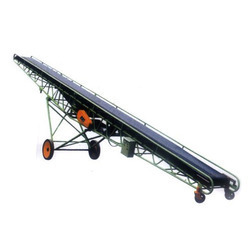 Portable Belt Conveyor consists of conveyor components and a frame structure supported by castors, tires or tracks. Portable conveyors can be moved manually or by another vehicle such as a transporter or bulldozer. Designs can also include crawlers which can be moved under their own power. The standard portable conveyor is moved by towing or pushing on the tail end. 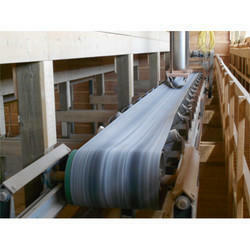 Portable conveyors can be both flat and troughing. 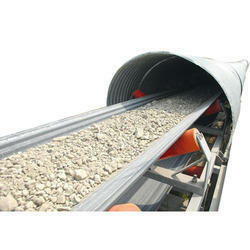 We offer Overhead Belt Conveyor to our clients. 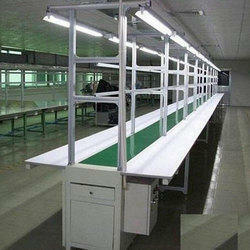 We offer Assembly Line Belt Conveyor to our clients.